When we have a netbook or notebook but cd/dvdrom is damaged already does not work and even netbooks do not provide a place for cd/dvdrom because the smaller size of the notebook and when we will reinstall windows xp or other windows its such as windows 7, windows vista, or windows 8 we will be a little confused if we do not know how to install windows without the cd/dvdrom. But with its many software or applications to make a boot able usb flash disk windows installer made​​, then to reinstall windows xp like windows xp sp2 or SP3 very easy even using usb flash disk upon installation the installation even be faster than reinstalling windows with cd/dvdRom. Actually many a great applications or software windows live CD installer maker but here I will only review this software. The name is Winusb maker and almost all the windows can be boo table usb flash drive like windows xp, windows 7, windows 8. Note: Flash disk be formatted then the data are in the flash disk must be backup and capacity should have a minimum of space flash disk should have a capacity of 2GB for windows xp, for windows 7 have to 3gb and windows 8 as big as 5GB. The Picture above is the latest version of WinUSB Maker version 2.0. 5. There are several options such as creating a bootable disk with the grub grldr boot linux and msdos bootable. 6. I do not recommend using that pirated windows, use the original windows. To begin to install windows xp or other windows by clicking the ISO file just click "Setup to USB" and select "I want to work with an ISO image file" and click on its button below "select an ISO file or directory" windows xp iso to choose in the disk directory, for start copying click the "Make USB boot able". 7. For copying windows in folder or in cd/DVDROM can click on the button "I want to work with a directory" Then again click the "select an ISO file or directory" to find the folder or CD/DVD ROM windows live to be in to a boo table usb pen drive. 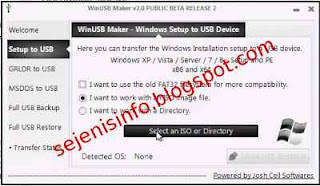 To start copy files to usb flash disk click the "Make USB boo table" and wait for finish. 8. After a flash disk already contains a live boo table CD windows xp sp2, sp3 or windows 7 or windows 8 to install probably already know how to install it, for that was a newbie can do as follows below. I told again that I do not recommend using a pirated windows. 1. Flash disk is definitely its already filled windows live CD. 2. Plug the usb flash drive on a computer, laptop, notebook or netbook then change the settings in the bios on the boot disk is part of the first set to 1st boot to usb boot or by restarting the computer and press button specified boot option settings by a computer, such as in general the key to make the disk boot option F7, F8, F9, F10, F11, F12 select one of them according by your computer settings, so the boot option will appear when it appears click boot to usb. 3. After booting to flash the initial display will be as shown below and press enter to continue. 4. Then the display will be seen below, click Enter to continue. 5. Next is up to you, that is probably already know to install windows, just follow the instructions given at the time of install windows xp in usb flash disk. 1. WinToFlash, Can be used for bootable windows xp, windows 7, windows 8, 2008 and others. 4. Windows 7 USB / DVD download tool, which is an official tool from Microsoft, can be used for windows 7, Windows 8. Sorry if here I give some examples of the software to install windows xp and other windows, not clear how to install windows xp that detail. For those reasons, if there is a mistake in this article I apologize. But I hope this paper could also be useful to those who want a little bit of my knowledge of the tools or software to install windows from usb flash drive.